Niluva Hlaalu is a Dunmer citizen who lives at Haelga's Bunkhouse in Riften. 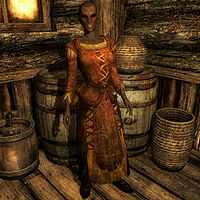 She works at Black-Briar Meadery but is struggling to pay her rent and is worried Indaryn will fire her for being a skooma addict. Trying to speak to her results in a series of defensive comments regarding how you cannot judge her for her addiction, ie: Don't look at me that way, who are you to judge me. and other. Niluva works in the meadery as a janitor, and she can often be found sweeping by the front counter. Niluva wears a set of farm clothes and a pair of boots. She is equipped with a leveled dagger which can be up to elven quality, and carries a selection of common loot and gold. Esta página foi modificada pela última vez à(s) 12h38min de 1 de julho de 2015.